The Gifford Design Group prepared site analysis, completed wetland permitting, Master Plan Design and final bidding specifications for the River Island Community Park. 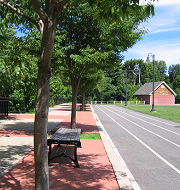 The riverside park involved a walking/running track promenade and a Canoe Launching Area along the Blackstone River in Central Falls, RI. The inspired design receieved the honor of the 2003 John H. Chafee Conservation Award from the Environmental Council of RI. 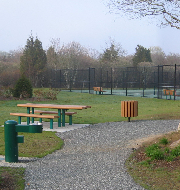 The Gifford Design Group provided concept design, Coastal Permitting documents and construction specifications for a coastal park of approximately eight acres in South Kingstown, RI. The project scope includes a playground, tennis courts, basketball court, parking facilities and a multi-use field. Construction began in Fall of 2001, with completion in Spring 2003; construction observation services were also performed by The Gifford Design Group. The Gifford Design Group prepared the site analysis, Master Plan Design and final bidding specifications for community recreation facility in an urban setting. 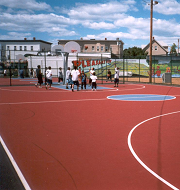 The project included basketball courts, playground climbing equipment and passive open areas. The project was completed in August, 2002.